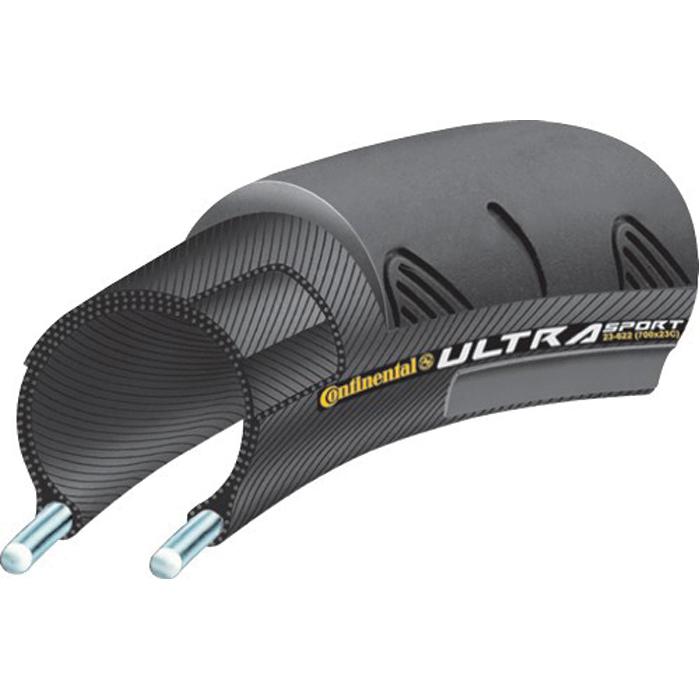 The UltraSport adds a new dimension to our road tyre range, offering our usual high quality make up yet at this entry level price.The folding bead folding option is a good choice as a lightweight, inexpensive racing tyre which gives great value for money. Nice tires little on the heavy side but good grip and the 28mm size feels good. Good tires for the price! Arrived quickly and have made a real difference to my road riding for the price. Very sturdy and grip feels good. Good value overall. Another product that's been around for years. Started back into racing on these years ago and they're still going strong. Says something when years later I use them to keep fit on. (Every little extra helps!!). Great tyre at a fantastic price.Why spend £40 on a tyre to ride on the sort of roads we have. A good cost benefit tire. Every year I bought it from merlin for my training. As you know it is a little bit soft to use in the race. But considering its price it is really good training tire. Bought these to replace the stock Vittoria Zaffiro IIs on my road bike. 28mm version. Did a 50 km first ride in heavy rain (spring time ) in Sydney, Australia. Had much more grip in the wet than I was expecting and would be an excellent commuter or training tire. Excellent price for both my road bikes. Excellent wear and value. So far so good. Only been on a couple of rides but I like them a lot. Used the Ultra ll for yrs. BEST tire value bar none. Long wear... excellent grip and not easily flatted. Great road tyre. Fast with low rolling resistance and certainly can be used in races. Great training tyre. Doesn't roll like the GP4000, but resists punctures just as well and half the price. These tires will give you a good bang for your buck and a reasonable performance. My previous pair of ultra sports lasted me around 6.000 Kms (3.700 miles) without one single puncture. Maybe I was really lucky, but I will give them another try. Great tyre, it`s durable and rolls well. Tried others but favour these Continentals. Can`t go wrong for the price. They cope well on our poorly maintained British roads. Cheap but very good everyday tire. Great tyres. Difficult to find in my neck of the woods. I've used these tyres before and always found them very durable and flat resistant. I am using a Fulcrum 5LG wheelset and found it really tough getting them mounted. It could be that they are new and when and if I get a flat, the process should be easier. Let's hope so. Absolute great tyres for this price. I had 4000S II before and couldnt observe any difference except a little more weight. For winter training just perfect. I think it can be use in races as well without issues. Great value. First 100 miles on wet / mucky country roads went well- no issues / no punctures. Also my first set of folding tyres - easy to install . Great tyres, been using these for years, very grippy and ideal for Summer use. Some say they puncture easy but I find any tyre can puncture given the same conditions, these are cheap and I would rather buy 2-3 sets of these than one pricey tyre. I run them in Winter too but some might prefer a thicker tyre. The 28c model adds and lot of comfort to the ride, without losing speed. Absolutely recommended for the price. Bought to replace my Michelin pro 4's. They are a much more confident riding tyre both cornering and braking though they feel a little sluggish on the climbs in comparison. 4000GP`s would probably be a more direct comparison. For the price they are very hard to fault and I'm very happy the the excellent service from Merlin's. Fitted to rear of my no. 2 road bike. Run 4000SII on no. 1. Feel comfortable enough but unable to judge durability yet. A dependable entry level folding tyre to have in my bag should I need it whilst riding. Good price and quickly delivered. Always my first choice when you want a good lasting tire. I will keep my eye out for more sales on this one. Thanks for the deals MCL. First time I have tried these tires and they seem very good so far, only done about 300km but they feel nice on the road. Really not expensive tyre... even if other say that it wears way to quickly I guess that at thie price you can easily afford to replace them once in a while. Do recommend. Great tyre for the money, rolling resistance and weight a big improvement on the Lugano I had fitted. Quick delivery. Tire is very nice. With the correct tire levers it is not to hard to get on the rim. Pay attention to direction of spin of tire when mounting so you do not have to do it more than once. Very good tires for off season riding or commuting. Durable and very flat resistant. I have the 25 mm Ultra Sports on my Jake the Snake cyclo cross bike and take them over gravel roads and trails with no problems. Great tires and great value for the money. Highly recommend them. I have used these tyres before and they have been puncture resistant. Good value for money. No Problem in fitting to the rim and inner tube. Bought a Campagnolo Scirocco Wheelset and fitted perfectly. Fitting was neither too loose nor too tight. Tyres seem to have the right grip. Great value for money tyre, good grip and good wear life. Great basic training tyres. Probably good for commuting too, but that is not what I am using them for. We have used Continentals for years. We see riders grinding to quick halt with a pinch or other flat while we spin by their repair efforts. Buy great tyres and don't compromise. At Merlin fab prices and great service why would you say no! Second set of these. Great all rounder and priced well. Light, fast and good looking tyre, that has certainly made the bike that touch faster...Decent on the hill climbs too! And at a fantastic price with Merlin once again!! Excellent price for a well recognised quality product and very fast and efficient delivery within 2 days which is one of the reasons why I'm always happy to deal with Merlin Cycles - as always very satisfying! Bought these to replace tyres on my boardman comp. Great tyre, rolls effortlessly, lasts quite well, about 1700 miles on the rear. These are great tyres and as usual merlin cycles cannot be beaten for price or service. Light & fast, great value bought three, dispatched quickly. Very happy to do biz with Merlin again. Good for trainning on roads..
Only used once for a 100 mile slippery Sportive road ride they kept me upright with no puntures, so good so far. Ordered this product on friday and it was delivered next day, saturday, absolutely amazing! The price was also cheaper than your competitors and the continental tyres are marvellous value for money. Well done Merlin Cycles. Great value tyres and great service from Merlin. The tyres were a bit tight to get on, however, this may just be my rims. Great all round training tyre with good rolling resistance. Very good puncture protection, even on broken inner city roads. Great service and price as always from Merlin, a highly recommended product. Quailty good value training tyres. good product with a very good price. i use this tires every day in my road bike and i dont have anything to complain.